Portals is a meditation on the idea of other worlds. Portals are defined as magical or technological doorways that connect two locations, dimensions, or points in time. I employ spheres and circular forms as an aesthetic and surreal motif of portals. The sphere is an ancient archetypal symbol representing a variety of contradictory ideas. Spherical bubbles – like hopes and dreams- burst and are ethereal. Yet, spherical shapes like planets and balls are moving objects constantly evolving, rotating, reshaping, and eternal. Ethernet Line, a mixed media work overlaid over a found photographed canvas of Paris’ Arc de Triumph, is an imagined line made of indecipherable words. It is interconnected by a series of interconnected bubbles floating across the landscape. Finally ‪#‎painting‬ again. Had to do something lighthearted to get my energy going. Here, Taylor Swift grabs a camera to take a selfie while wearing cat ears. Yet behind her, the scene is different. The girly innocence of Taylor Swift is contrasted with national bohemian beer and a scantily clad dancer who dwell among a cropped background of chaotic patterns and expressionistic colors. I’m excited to announce I’ll be exhibiting at the United Nation for an exhibition entitled “Palestine: Memories, Dreams, Perseverance” held at 6 p.m. on Thursday, 29 November, at the North-East Gallery of the Visitors Lobby. This show is presented under the auspices of the Committee on the Exercise of the Inalienable Rights of the Palestinian People, in observance of the International Day of Solidarity with the Palestinian People. 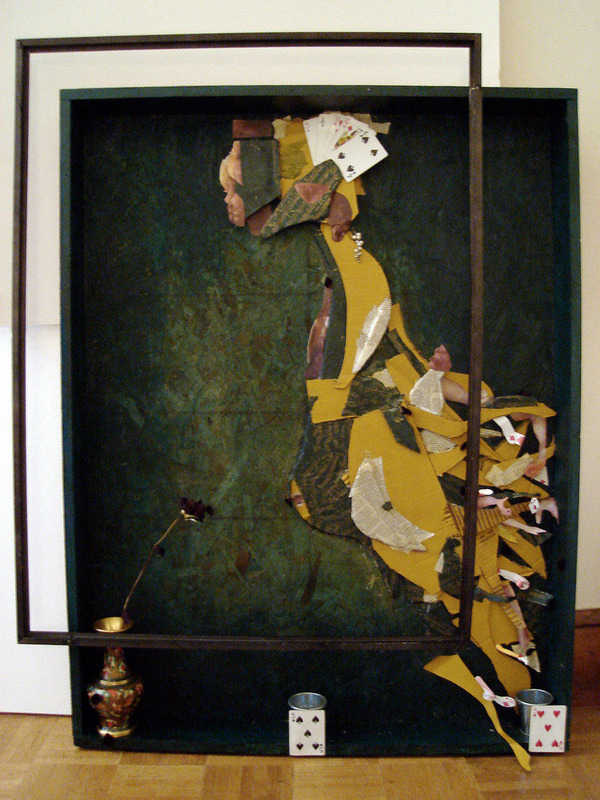 The exhibit represents two of my installation works along with creations by three other artists. The content and narrative behind each piece explains our reactions to our Palestinian origins rooted in themes of dreams, identity, and memory. 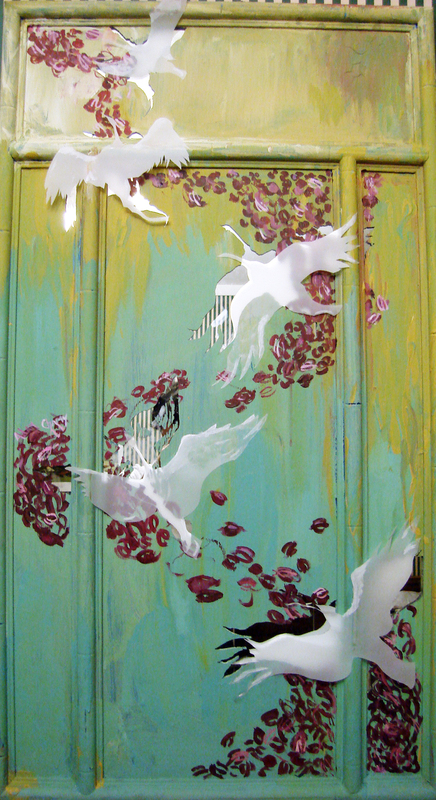 My installation works weave themes of migration, roots and belonging to explore questions of spirituality and identity. I believe the exhibit is open to public. I will be at the opening tonight, November 29th at 6pm, and hope to see you there! One more work of altered currency from my Rebellion series to be exhibited at an international exhibition held at the Museo del Brigantaggio in late August with members the Ali Ribelli art collective and other international artists. This one is a bit of a commentary on the Arab Awakening in Egypt. How will Egypt identify after the rebellion settles? Will it be a new revolution with youth raising their hands and a twitter handle or will Egypt think of herself within the confines of the traditional banknote – mosque still looming in the background? Thoughts? Where has this Egyptian revolution headed? This work of altered currency may cause a bit of controversy and I honestly had to shore up a bit of courage to create it. I suppose there is no greater act of rebellion than doing art that is challenging. It is from a recent series exploring the connection between currency, identity, and rebellion that will be exhibited late August at the Museo del Brigantaggio in Itri, Italy as a part of the Ali Ribelli art collective first international exhibition. The New Palestinian Shekel is my way of exploring issues of rebellion and national identity through the lens of currency. Palestine, as an emerging nation, is reclaiming its identity within the borders of modern day Israel. Likewise, Israel, since its inception has had undeniable connection to the Palestinian people. 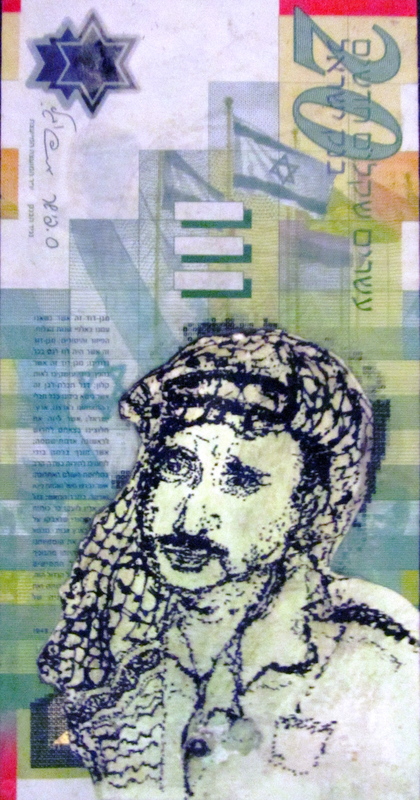 The New Palestinian Shekel is both an act of satire and thoughtful reflection on the economic, social, and political connection between the two nations. Perhaps, borders are not only drawn on maps but drawn by circulation of currency, economic, and social ties. Each musician is paired with an artist to create works inspired by the first song they play. Paintings can be purchased at the end of the night via a silent auction. Cover (it is a concert!) is $10. You will see some great live music, some fantastic local artists, and me hopelessly painting in front of a crowd for the first time! Hope to see you there!